We plan to visit 50 locations across Scotland, from Shetland in the North to Stranraer in the South. 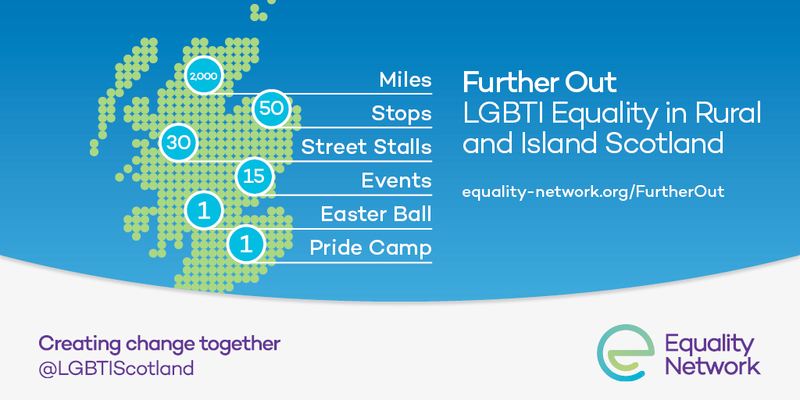 We’re holding LGBTI information street stalls, events and coffee meetings all over Scotland. LGBTI Information Street Stalls: We’ll be pitching our Gazebo on high Sstreets and town centres in over 30 locations. Providing information on LGBTI issues, chatting to local people about equality and carrying information from partner organisations like LGBT Health, Stonewall Scotland, LEAP Sports and LGBT Youth Scotland. Further Out Events: We want to bring LGBTI people together to discuss what life is like for them in their communities and what can be done to bridge the LGBTI equality gap with urban Scotland. We’re planning 15 events in community centres, libraries and theatres. Coffee Meetings: We want as many people as possible to get involved, but we know that for some very rural and island communities sometimes there aren’t the numbers to have events so that’s why we’re happy to meet up for a coffee and a chat to discuss your experiences. Rural Survey: In 2015 we published the Scottish LGBT Equality Report, it highlighted an LGBTI rural / urban divide that’s why we’ll launch a survey on Monday 27th September to better capture the experiences of LGBTI Scots outside our urban centres.